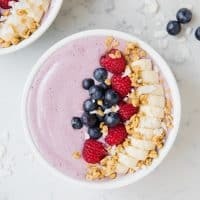 PB&J Breakfast Bowl -your family’s favorite sandwich in a bowl! Simple, creamy and naturally sweet topped with all your most loved fruits and granola. 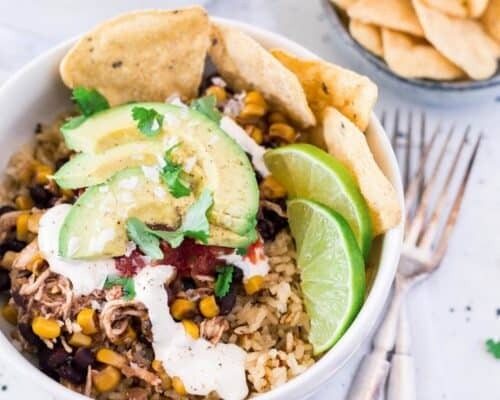 Breakfast bowls are all the rage these days and for good reason. 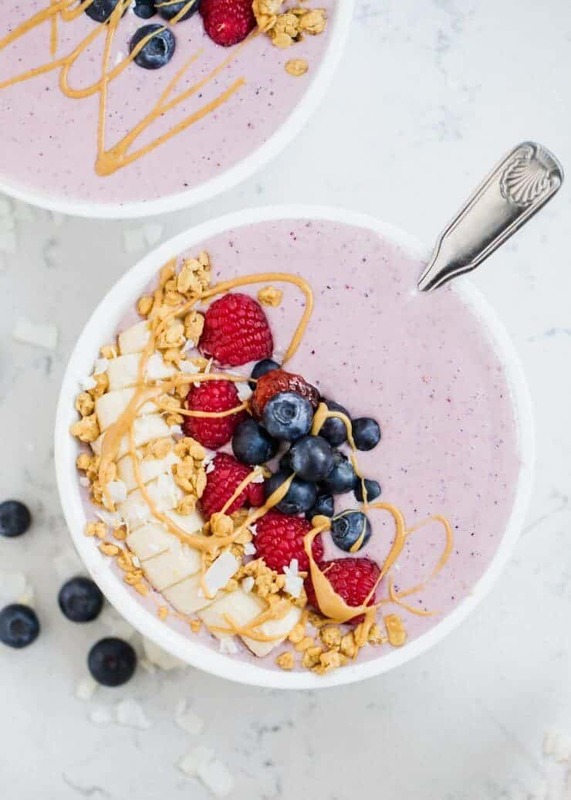 They have all the components of a great breakfast, including protein-filled yogurt, fresh fruit and delicious toppings. Plus, breakfast never looked so good! 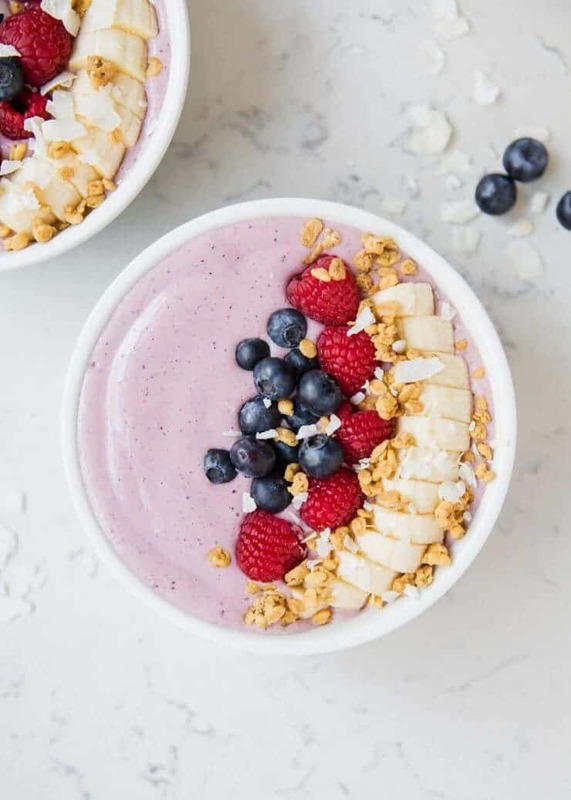 This berry breakfast bowl is going to be your new favorite; I hope you’ll give it a try. We love making them for breakfast, but you could enjoy them as an afternoon snack or even a late night dessert. 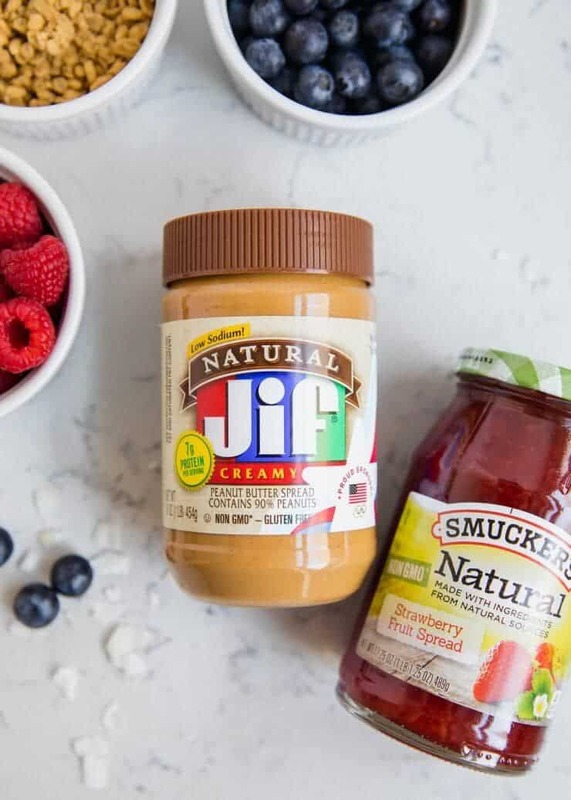 I’m excited to be partnering with Jif® & Smucker’s® for this post. They are supporting everyone to go for the gold like Team USA, with a winning PB&J combination. 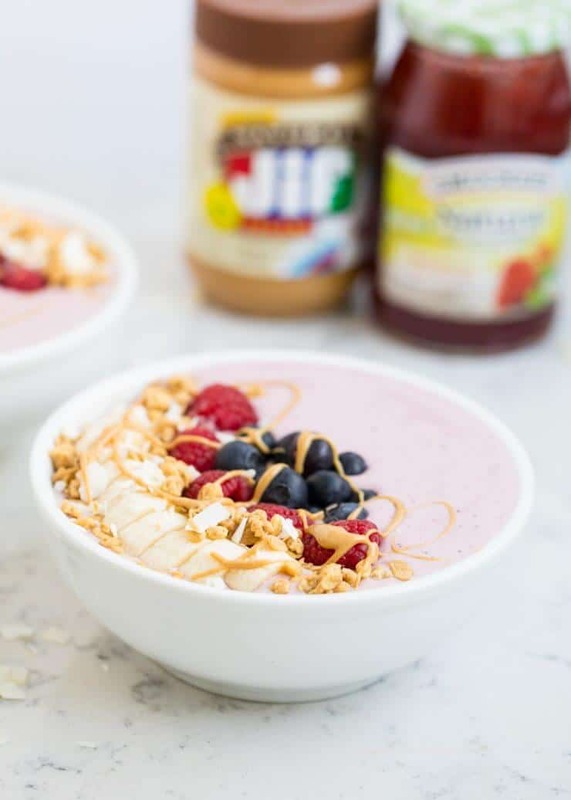 It’s no secret that my kids love PB&J’s, so we took our favorite combination to make a breakfast smoothie bowl to give them the energy they need to go throughout their day and go for the gold! When we’re in a hurry and don’t have time to prep a snack, the kids can grab Uncrustables®, a delicious premade peanut butter and jelly sandwiches to keep them fueled and energized throughout the day. At this point pour into a bowl and top with any of your favorite toppings such as cereal, granola, nuts and fresh or dried fruit. We love to top ours with sliced bananas, granola, fresh berries and coconut. We’ve got the red, white and blue theme going on for our smoothie bowl to support Team USA! I always love to watch the Figure Skating and BobSleigh. If you’re feeling extra fancy, you can drizzle some melted peanut butter on top. 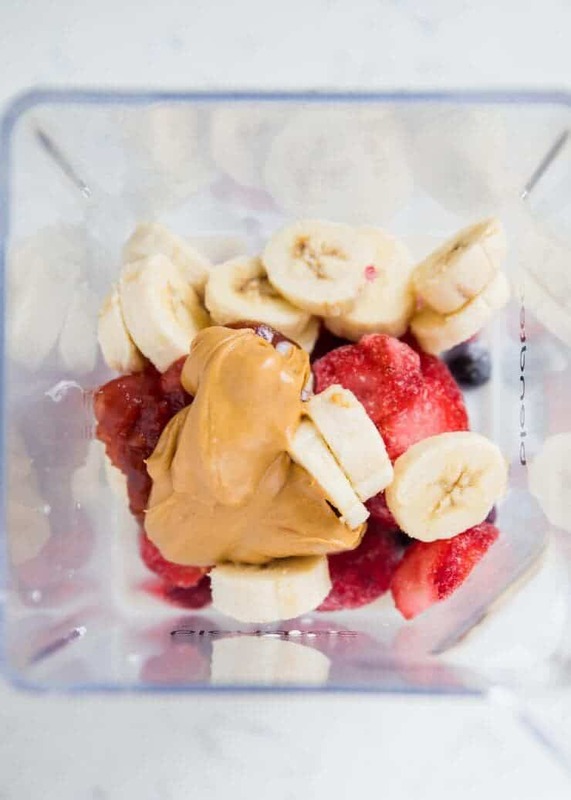 Hope you enjoy this PB&J breakfast bowl. It’s one of our favorites! Are you a PB&J fan? Smucker’s and Jif will be donating $100,000 to the United States Olympic Committee to support future Team USA athletes. Simply share a photo using #PBJ4TeamUSA showing your love for Team USA and America’s favorite sandwich, PB&J! This post was brought to you by The J.M. Smucker Company. 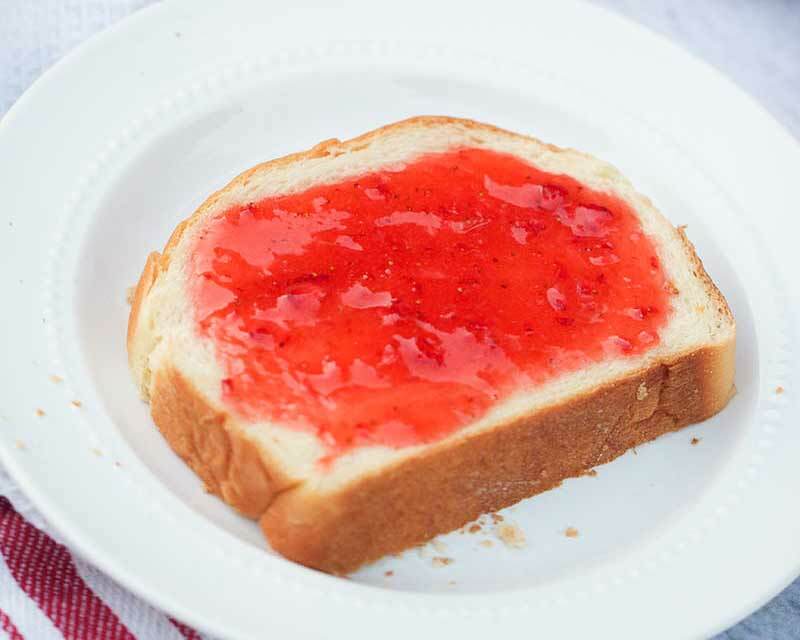 For more Jif and Smucker’s PB&J creative recipes, and fun facts visit www.lovepbj.com. 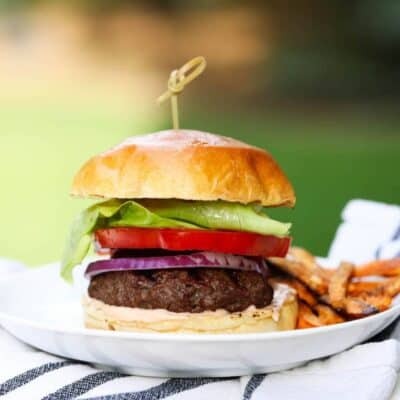 Super yummy and super easy to make! Makes a great breakfast, or a yummy snack in the afternoon. I made mine with granola, strawberries, blueberries, and coconut flakes. Would definitely recommend! Loved it. It looks so pretty! I love those fruits and flavors! This looks super tasty and fun, not to mention beautiful! Love it! Oh yes! This is my type of breakfast! 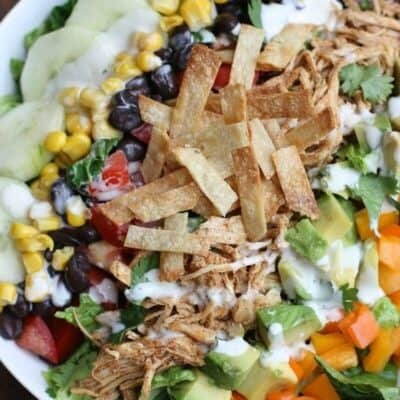 This dish looks and sounds amazing! What a great way to kick off the day. 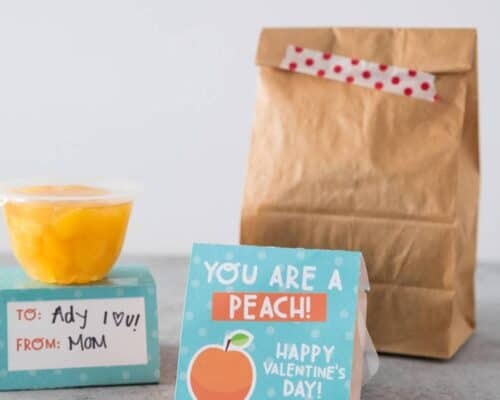 What a fun idea…..and it looks SO DELICIOUS! Bursting with flavors! Such a perfect breakfast! What a gorgeous looking bowl!! This is going to be such a great way to change up our normal breakfast routine. Made this morning! So easy and yummy! A lot cheaper than ones you buy at stores. 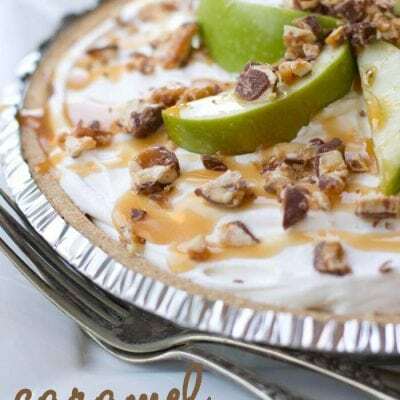 This looks so pretty, I love the drizzle of peanut butter! It doesn’t look too hard to make either, which is perfect for me. That’s this week’s birthday breakfast sorted – yum!